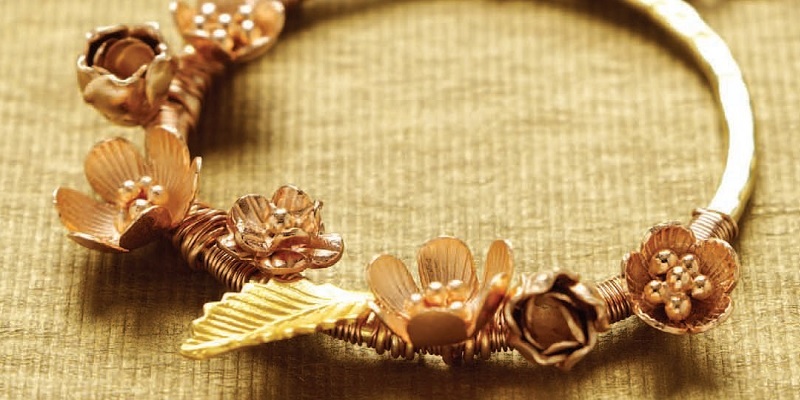 Rose gold jewelry continues to be a popular jewelry trend. But the pretty pinkish hue of rose gold makes it timeless, too. It’s hard being a girl in a modern world! 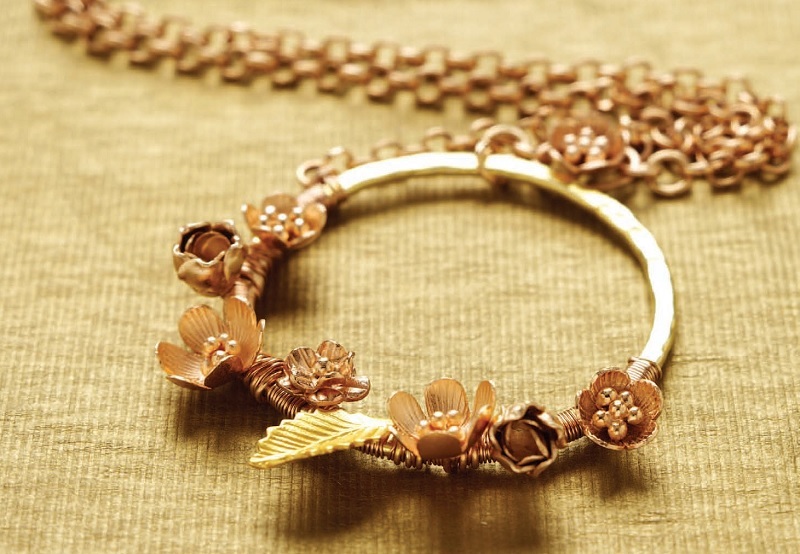 Fortunately, we can be modern and trendy while being classic and timeless with the Rosy Posies rose gold vermeil jewelry project. This pretty pendant, from Melinda Barta and Danielle Fox’s book Mixed Metals, combines vermeil yellow and rose gold jewelry components into one versatile design. Here’s how they made theirs; in the spirit of mixed metals, feel free to use your own variety of metals. 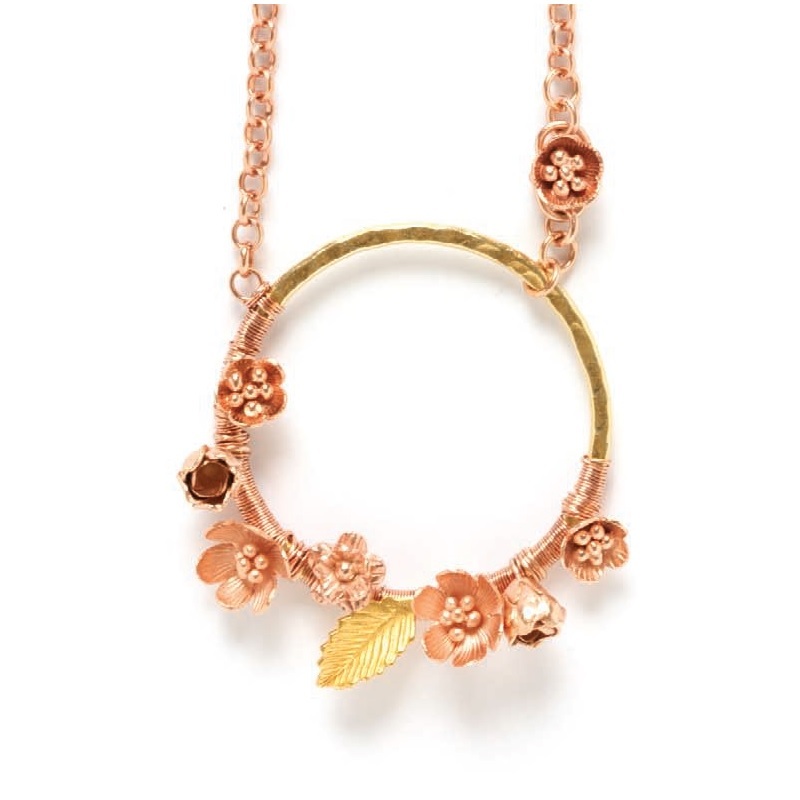 Wrap flower-tipped rose gold vermeil head pins around a vermeil ring to create a wreath-like pendant that sings the praises of pink! Vermeil (pronounced vehr-may) beads and findings have a sterling (or fine) silver base that is bonded with a layer of gold, which must be at least 10k gold. Rose- or pink-gold vermeil beads and findings have a different appearance than regular vermeil. 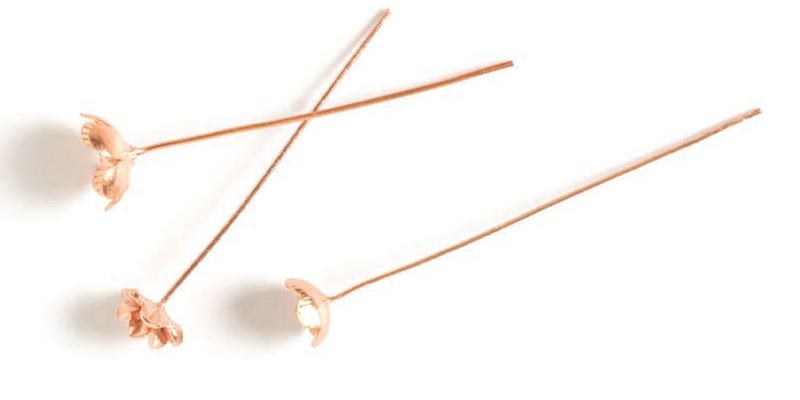 They have a sterling (or fine) silver base that is bonded with a layer of rose gold, a gold alloy that contains a relatively high percentage of copper (thus the reddish tint) and usually some silver. Hold the flower end of one 72mm head pin snugly on top of one side of the vermeil ring (this will hereafter be referred to as the front of the ring). Tightly wrap the tail of the head pin twice around the ring, being careful not to push against the back of the flower in a way that will break the flower off the pin (the soldered joint can be fragile). Trim the tail of the head pin at the back of the ring. Repeat Step 1 seven times to attach the remaining head pins to one half of the ring, placing each about 1/8 to 3/8″ (3 mm to 1 cm) apart, with the leaf in the center. Use chain-nose pliers to make a 90-degree bend 1/8″ (3 mm) from one end of the 26-gauge wire. Hold the bent 1/9″ of wire flat against the back of the ring, parallel to the back of the ring, and about 1/4″ (6 mm) away from the row of head pins, making sure the end of the bent wire points toward the first flower added. Tightly wrap the working end of the wire several times around the ring to cover the 1/8″ (3 mm) tail, placing the wraps snugly next to each other and working your way toward the first flower. When you reach the first flower, wrap as closely as possible up to one side of the flower, then begin wrapping again on the other side of the flower. You will need to wrap over the head-pin wraps. Continue wrapping the wire around the ring and up to the last flower. Make wraps for another 1-1/4″ (6 mm) beyond the last flower, stopping with the wire on the front side of the ring. Use the wire to string the last link on one end of the piece of chain. Then wrap once more around the ring while holding the chain link on the outside (edge) of the ring. Make 3 more wraps around the ring and through the chain link, securing the chain to the ring. To finish, make 3 perpendicular wraps between the chain link and the ring. Then trim the wire at the back of the ring. Use 1 jump ring to attach the free end of the chain to one of the clasp’s soldered jump rings. Attach 1 jump ring to the bare half of the vermeil ring. Use another jump ring to attach the previous jump ring to the clasp’s free soldered jump ring. Rose gold colored jewelry is especially pretty paired with silver and other white metals, mimicking the fashionable pink-and-gray color combo. Mixing metals in jewelry has been stylish for years. I think it’s a free and easy way to enjoy all of your jewelry, however you want! That applies to making jewelry using any of your favorite components in one design, too. 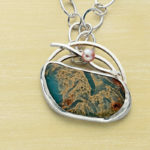 Mixed metal jewelry leads to more interest and versatility in your jewelry wardrobe. No need to separate yellow metals from white metals and so on–everybody in the pool! There are no rules when it comes to mixed metals anymore–and I love it. If you do, too, get loads of inspiring mixed metal jewelry ideas in Mixed Metals: Creating Contemporary Jewelry with Silver, Gold, Copper, Brass & More by Melinda Barta and Danielle Fox. Who knows jewelry making better than two former Interweave jewelry editors? They’ve seen it all; see the result in Mixed Metals. 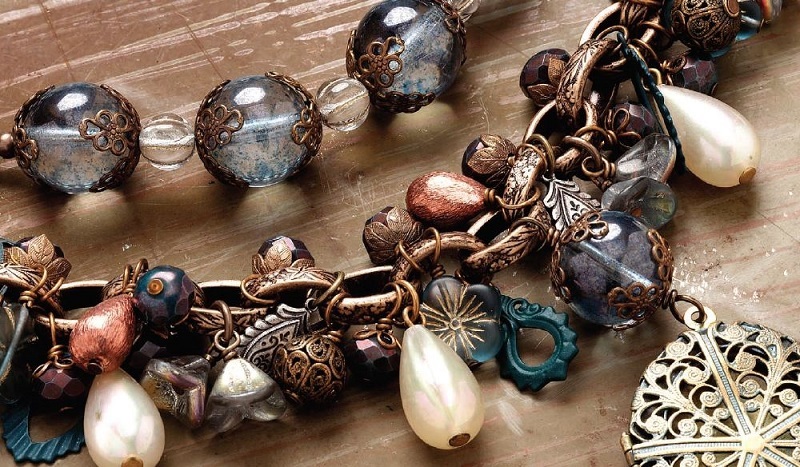 Mix things up in your jewelry designs with Mixed Metals! Where is the best place to get these findings? I’ve searched for them but can’t seem to find them. Head pins, clasp, jump rings, chain, and wire: Shiana. Ring: The Bead Goes On. I imagine the flower head pins are the most important ones; the others could be easily swapped for similar pieces. If you aren’t able to find these particular findings there anymore, I’d search online for “flower head pins.” I also found some by searching “copper flower jewelry head pins” etc. I found the most options by searching “flower head pins” on Etsy.com. I hope you find findings you like and are able to make your own version of this pretty design!